Air Wick Reed Diffuser Air Wick Reed Diffuser uses natural rattan stems to delicately diffuse wonderful fragrances. Create a welcoming atmosphere in your home with its natural fragrance experience and elegant design. Fresh Breeze Let the fresh breeze come into your home with a mix of crisp linen, juicy green apple and airy breeze. PLEASE READ CAREFULLY THE SAFETY AND PRECAUTIONARY TEXT BEFORE USE. KEEP FOR FUTURE REFERENCE. 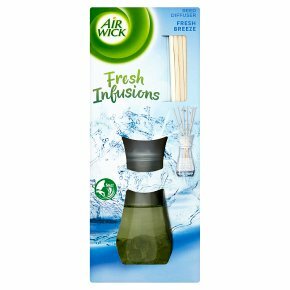 Use only as directed.<br>AIR WICK Reed Diffuser Fresh Infusions Fresh Breeze. Harmful to aquatic life with long lasting effects. Contains 2,4-Dimethyl-3-cyclohexen-1-carboxaldehyde, Dimethylcyclohex-3-ene-1-carbaldehyde(isomer mixture), Acetyl cedrene, Citral, alpha-iso-Methylionone, (E)-1-(2,6,6-Trimethyl-2-cyclohexen-1-yl)-2-buten-1-one, 2-Methyl-3-(p-isopropylphenyl) propionaldehyde, 2-Methylundecanal, Methoxy dicyclopentadiene carboxaldehyde, Linalool. May produce an allergic reaction. Keep out of reach of children and pets. If medical advice is needed, have product container or label at hand. IF SWALLOWED: Immediately call a doctor. IF ON SKIN: Wash with soap and water. IF IN EYES: Rinse cautiously with water for several minutes. Remove contact lenses if present and easy to do - continue rinsing. People suffering from perfume sensitivity should be cautious when using this product. Air Fresheners do not replace good hygiene practices.